As promised last week when I shared my homemade sausage gravy, today I’m sharing my can’t-fail super easy homemade biscuit recipe. This is the biscuit recipe for people who don’t know how to make biscuits. These quick biscuits are made totally from scratch and you don’t need anything fancy whatsoever. Start to finish they take about thirty minutes so it’s a fast recipe too. Why is it such a Simple Biscuit Recipe? These biscuits are more like drop biscuits, there’s no rolling out the dough so you don’t need a biscuit cutter. These quick biscuits are perfect for breakfast, lunch or dinner and you have all the ingredients already in your kitchen. If you want your biscuits to be “prettier” you can easily roll the dough out on a lightly floured surface to 2″ thick and cut with a biscuit cutter. I rarely take the extra time to do this because they taste the same and it keeps my kitchen cleaner! Making biscuits couldn’t be easier! 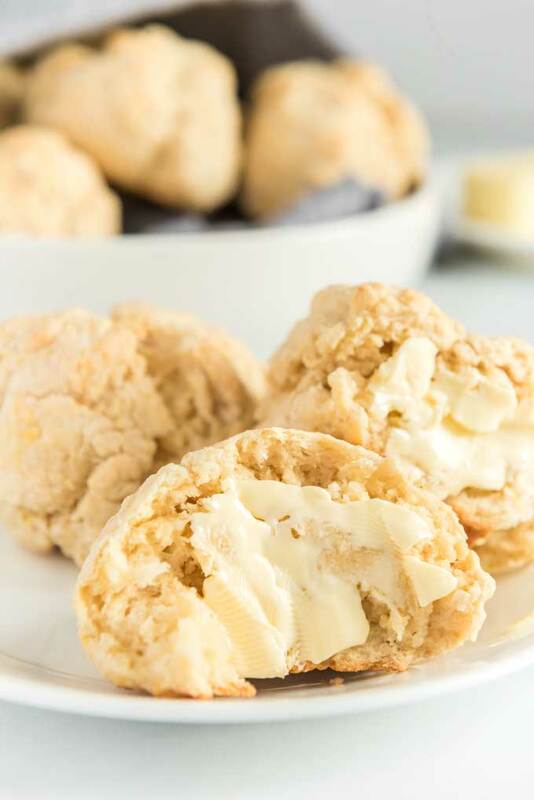 Try this no-fail easy homemade biscuits recipe for breakfast, lunch or dinner. This simple quick biscuit recipe is ready in just thirty minutes, no special ingredients or tools required. In a large bowl combine flour, baking powder, and salt. Cut in butter with two knives until it’s soft and crumbly. Add egg and milk and stir until totally mixed. Use hands to form 2″ balls of dough and place on baking sheet. For “prettier” biscuits feel free to roll the dough 2″ thick and cut with biscuit cutter. 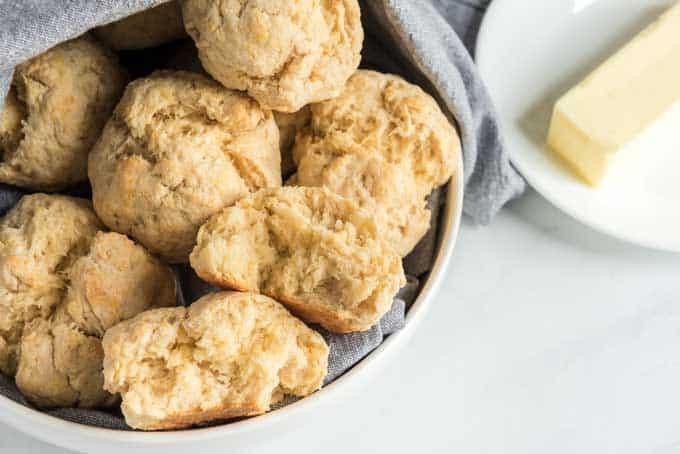 I love these quick biscuits for breakfast with my sausage gravy as I mentioned but they are also delicious warm out of the oven with butter and jam as well. For dinner, we’ll serve these on the side with hearty meals like pot roast, stews, and soups. This is also a great recipe to have the kids help out with, it’s almost impossible to mess up and they’ll be so proud of themselves for helping! 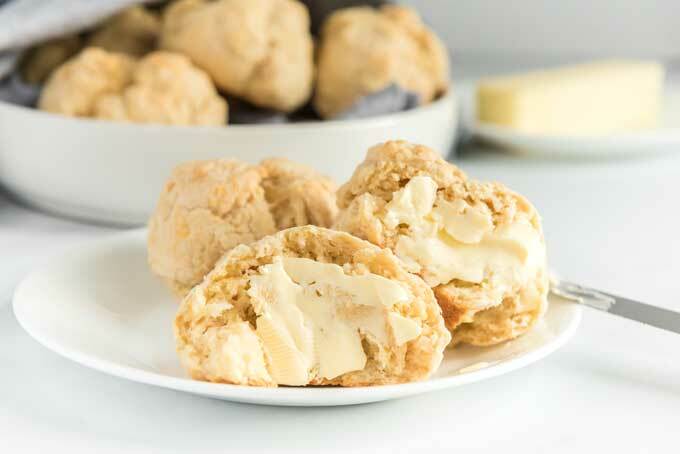 What would you serve this biscuit recipe with? Do you make your own homemade from scratch biscuits yet? If I could go lower I would. I misplaced my go to recipe and made this instead. Never again! Really 4 tsp of baking powder???? I knew better but was fresh from a root canal yesterday. No more recipes from this site! Melissa – I had the same problem- they looked lovely, but tasted strongly of baking powder. Texture was great, but bad flavor. Best recipe for biscuits, hands down! My husband is from the South, so he considers himself an expert, and he loves them as much as I do! I’m not sure why the previous poster had a problem, these turned out well for me, I’ve made them three times so far. Thanks for the recipe! A few weeks ago I was looking for a homemade biscuit to go with my sausage gravy and this one was perfect! My boyfriend loves them too. He asked for this ones specifically yesterday. Wonderful recipe! I found this recipe when I decided on a whim that we needed some biscuits to go with our soup last night. I’m so happy I came across this one! It was so quick and easy. The biscuits were absolutely perfect! My family and I loved them so much that we made them again tonight with sausage gravy. 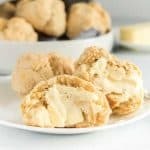 I used this recipe a few weeks ago and my family just loved them, and i am just getting ready to make them again righr now, my boys are requesting these biscuits again!!!! I made these and added a little cheddar cheese to the top of them. They were awesome, I will definitely make these again!! Thank you so much to the creator’s of this recipe!!! WOW! I just tried this recipe for the first time and I cannot believe how easy and fluffy they were! They are just like angel biscuits! I will be making these every time I need biscuits from now on! I’m so glad you liked them Melanie!! I RARELY make anything from scratch but I was hungry for my mom’s homemade biscuits so I found this recipe. Ooooh my. They were PERFECT! I’m actually making them again tonight.